For the production of injector bodies, EMAG offers turning centers for soft machining by chipping, induction hardening machines by eldec, and electro-chemical machining centers for deburring or inner forming. EMAG offers a wide range of machining technologies for the production of injector bodies. The soft machining of the injector body blanks is done on vertical turning centers of the VSC and VTC machine series. Depending on geometry and complexity of the injector body, a combination of VSC and VTC turning centers is another option. The external turning operation on the injector bodies is done with four axes on VTC 100-4 vertical turning centers. 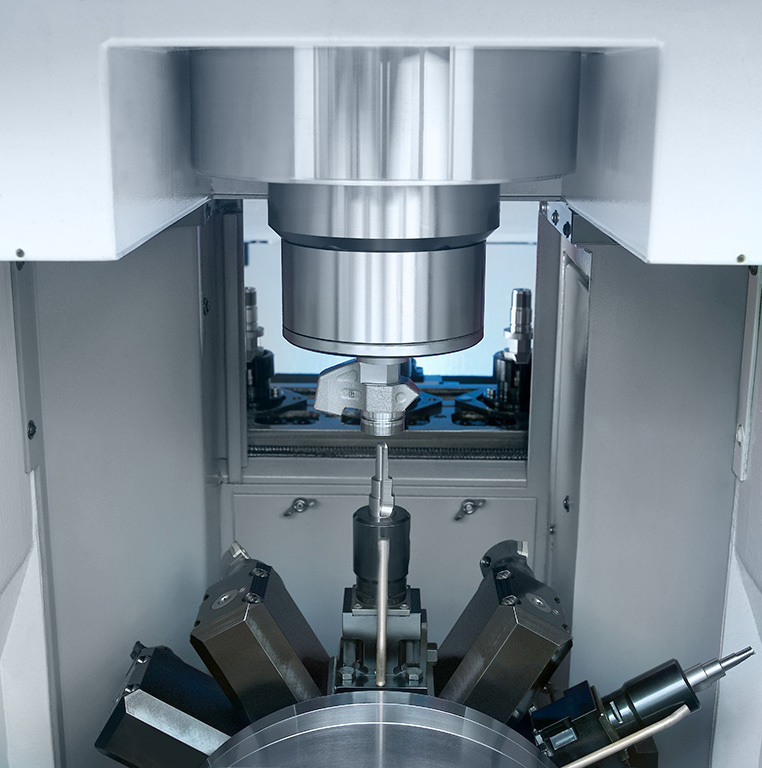 The turning center displays its strength particularly in medium to high volume production, since its automation solution allows very short chip-to-chip times and low workpiece costs: Workpiece grippers in the tool turrets move the blanks into the machine, and pick them up again after processing. Depending on the workpiece, this change-over time only takes between six and eight seconds. The internal machining of the injector bodies is done on VSC series turning centers. 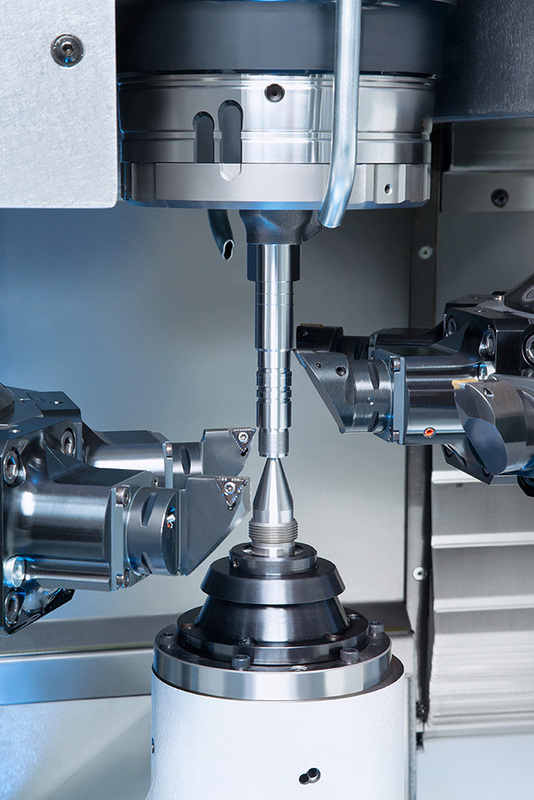 To minimize vibration during turning, milling and drilling, the vertical turning centers are equipped with a hydrostatic guideway for the Z-axis spindle. The tool turret carries 12 turning tools or, as an option, up to 12 driven tools for drilling and milling. For more details about the turning centers of the VSC series (for chucked parts) and VTC series (for shafts), see the Machines section below. The induction hardening of injector bodies is is completed with the EMAG eldec MIND 750 induction hardening machines. Depending on injector body dimensions, desired hardening finish and batch size, the eldec MIND induction hardening machine is configured individually and customized to achieve optimum hardening results. In addition, the MIND 750 induction hardening machines can be automated if desired, using robots or gantry loaders. The hardening systems can be integrated perfectly into production lines with soft and subsequent hard machining processes. For exceptional demands regarding the material used, or for geometries that can no longer be produced by chipping processes (turning and milling), electro-chemical machining provides the best option to achieve the required production parameters economically. For example, the injector bodies can not only be deburred with electro-chemical machining, but defined shapes can also be applied into the injector body by inner forming. Intersecting drill holes within the injector body can also be deburred or chamfered by electro-chemical machining. In such cases, electro-chemical machining provides excellent production results since there are no negative effects on the material structure during the machining process.